With the rise in popularity of microblogging, we must consider whether such social networking can be harnessed to bring benefits and outcomes to the professional development of teachers. Recent research shows us that Twitter is becoming more and more popular in classrooms, and has documented benefits in educational outcomes. This paper discusses the role of Twitter in a graduate seminar on language teaching methodology. More than 80 teachers in training from around the U.S. and Canada tweeted regular reactions to and reflections of their experiences as new teachers, and participated in a follow-up survey. Discourse analysis was performed on the content of the tweets which, combined with the survey data, reveals that the microblogging tasks enabled participants to form a virtual Community of Practice in which they were able to learn, share, and reflect. Lord, G. & Lomicka, L. (2014). Twitter as a tool to promote community among language teachers. 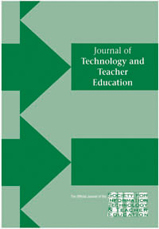 Journal of Technology and Teacher Education, 22 (2), 187-212. Waynesville, NC USA: Society for Information Technology & Teacher Education. Retrieved April 24, 2019 from https://www.learntechlib.org/primary/p/49768/.